Back in November @CKsays from NYC tweeted a question to us asking if we knew of any ESPs offering iPhone apps for their platforms. In fact, we did and we posted that same day with 3 different options. This post drew a huge amount of traffic and we’ve been keeping our eyes and ears open for other possible iPhone solutions ever since. We’ve found three more great iPhone apps from 3 great ESPs which you might want to stuff in your stocking this holiday. 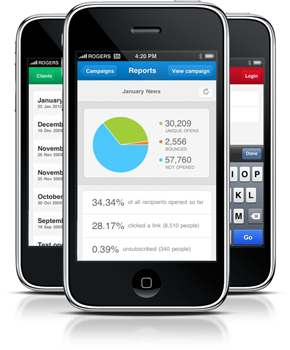 The iPhone application’s date-range dashboard allows you to quickly view statistics from live campaigns. 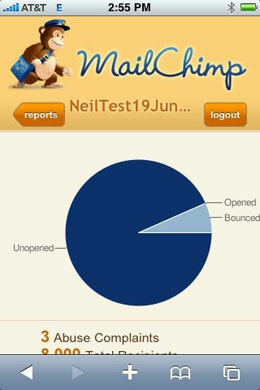 View emails sent, open and click through rates, sales, and much more, in seconds! 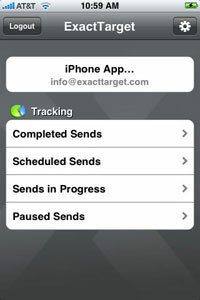 You can add contacts to your campaign list using GetResponse for iPhone. 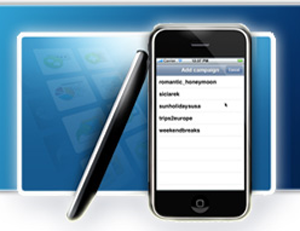 Simply enter the name and email, or import directly from your Address Book. New subscribers will be added to your campaign and ready to receive your next email. Get the latest updates for all of your campaigns, at any time, directly on your iPhone. Pause an in-progress campaign or re-launch one that was previously interrupted. Follow the status of your Sent, Scheduled, and In-Progress campaigns. 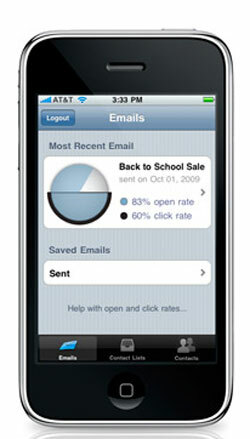 View key performance indicators such as Click-Through Rate, Open Rate, and Complaint Rate directly on your iPhone. Display your campaigns in a list view or in a Calendar view, and jump to future dates to see scheduled campaigns. Give other members of your company the ability to follow all campaigns, even if they don’t have prior knowledge of Campaign Commander™. 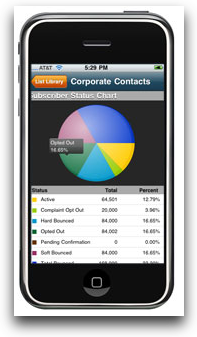 Stay connected to your email sends and increase mobile productivity with real time activity metrics. Subscribe people you meet (such as at trade shows and events) to your email lists. 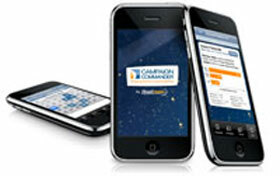 Campaign Monitor chose to focus on creating a mobile web version of their service. They reasoned this was a more flexible approach for their clients and especially resellers — the mobile app route keeps it all private label if you wish. There’s no need to download anything from iTunes or anywhere else since you get the mobile version simply by logging on to your account from any mobile web device such as an iPhone or Android. According to Campaign Monitor, they put a lot of work into optimizing the app for iPhones since their research shows this to be the overwhelming mobile device of choice for their clients. 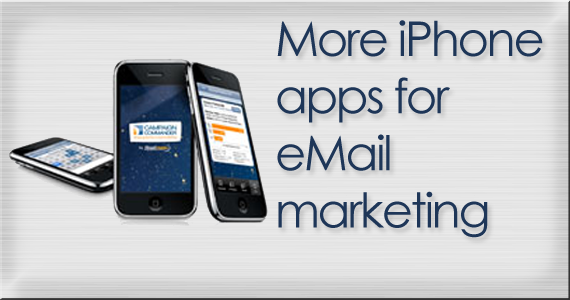 If you know of any other great smartphone apps for eMail marketing, post your comment and let us know! What’s this iPhone you speak of? . I wanted to chime in with an answer to Andrew’s question on where Silverpop weighs in on iPhone apps. We’ve been tinkering w/ app development for a while now, and although we have some solid ideas on what we believe would be valuable to our users, we haven’t actually had any customer or market demand for it. So, to date, we’ve held off on any formal launch plans for an app of our own. I’d be very interested to learn what kind of adoption (and continued use) the ESPs have seen for their shiny apps. I’ve checked with the folks at Silverpop and they don’t have an iPhone app at the moment. I’ve invited them to comment here about what they are up to. Where is SilverPop? Get on it boys! You are most welcome! As for differences, I guess it depends on the feedback your clients are giving you (at least I hope it does). Thanks so much for the iPhone App love. Interesting to see what other ESPs have apps. Seems like they are all a bit different, huh? P.S. When are y’all installing the “email me when there are new comments posted” plugin?